When the iPhone was first launched some of the photography fraternity got very sniffy about its legitimacy as a proper camera. After all, no self-respecting photographer would use a phone to take photographs; serious photographers lugged around several kilos of camera and lens instead. It wasn’t long before the young rebels in the photography industry declared that the best camera to use was the one that you had with you and if that was your phone camera that still made you a photographer. Amen to that. 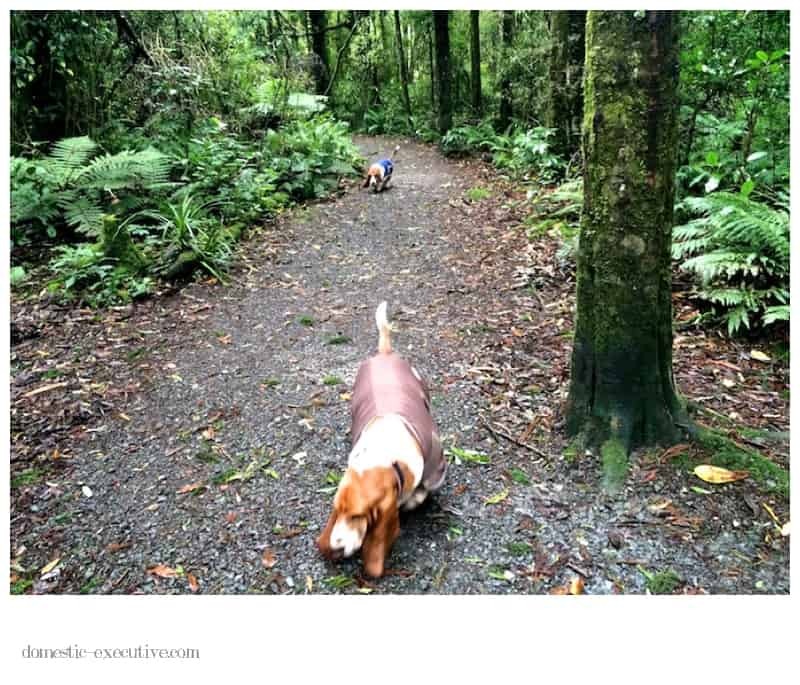 I rarely carry my SLR any longer on my daily walks with the bassets unless the light looks particularly appealing and I have time to spare boosting the basset image library. Instead I rely on my iPhone which I carry with me like a security blanket as if it will cure-all ills and keep me safe during unexpected earthquakes. 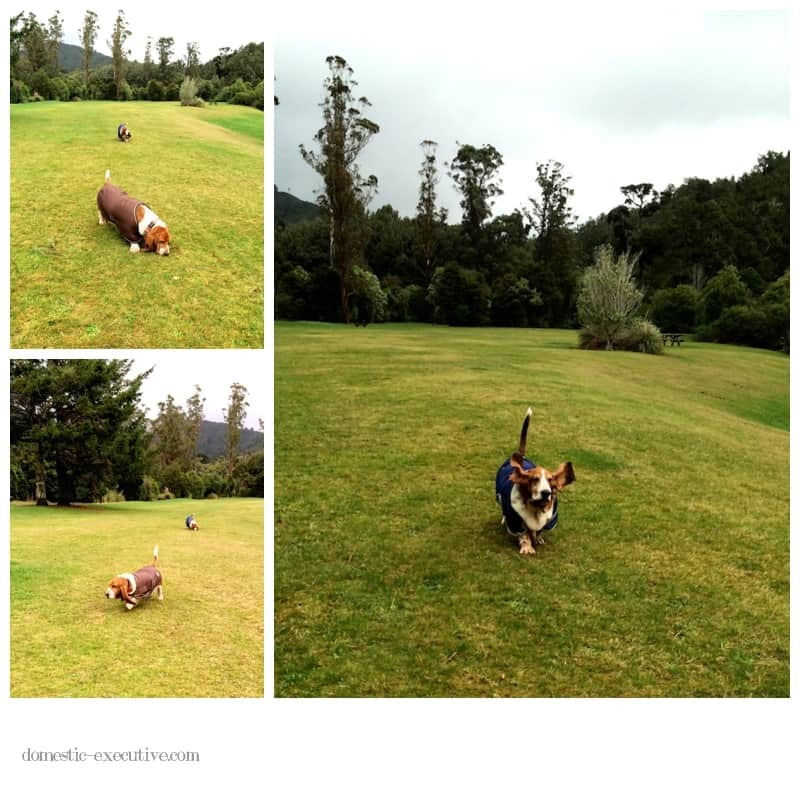 So here’s my disclaimer, I took all these photographs with my iPhone and although originally destined for my Instagram feed on closer inspection I decided they were perfect basset blogging material instead. 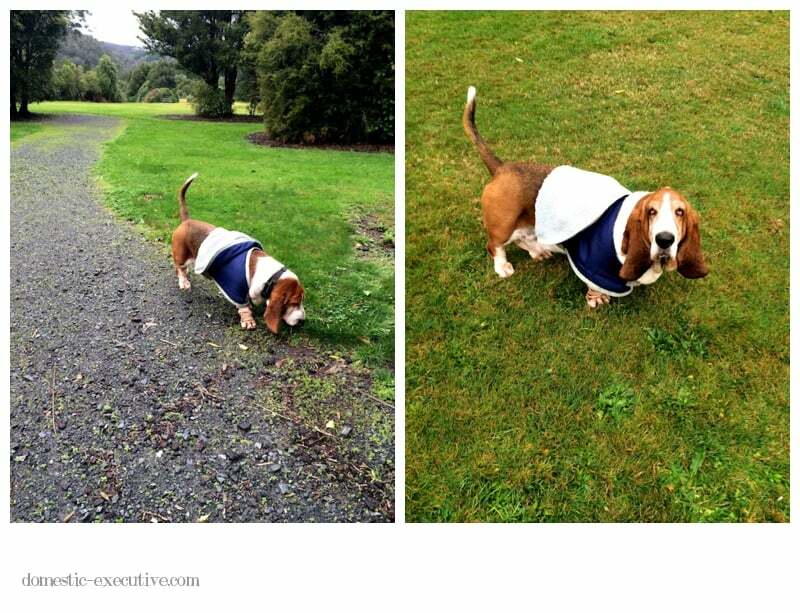 Just before I left on my trip to the UK a bitter southerly was a stark reminder that we are in winter bringing biting winds and damp weather, the worst combination for a basset with creaking joints. Poor Fortnum started suffering with arthritis over a year or so ago, a natural result of being a big dog on little legs. To combat the worst of the effects he has an outdoor coat for bitterly cold days, a daily natural food supplement and wears a magic collar that together keep him mobile and his tail wagging in ways that he didn’t without. 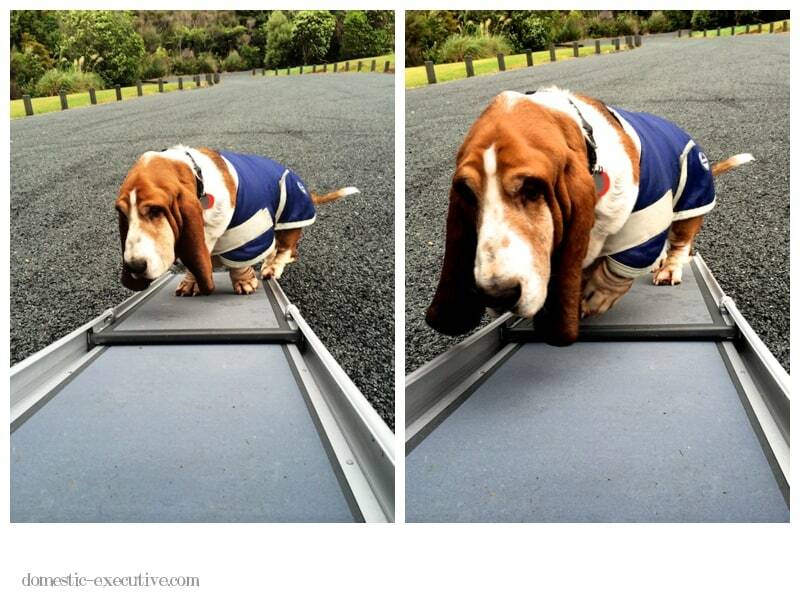 For extra special measures, we are now the proud owners of a special pet ramp so the hounds can wander in and out of the car, instead of leaping down putting further pressure on their ageing legs. If you’re raising your eyebrows at the extensive array of pet pampering you’re not the only one. Fortnum is not keen on being shown up when he’s out and about especially if other dogs are looking. Mason of course thinks it’s all marvellous and sees his coat as the only reasonable alternative to staying indoors in front of the fire although it doesn’t stop him taking every opportunity to take shelter wherever he can. 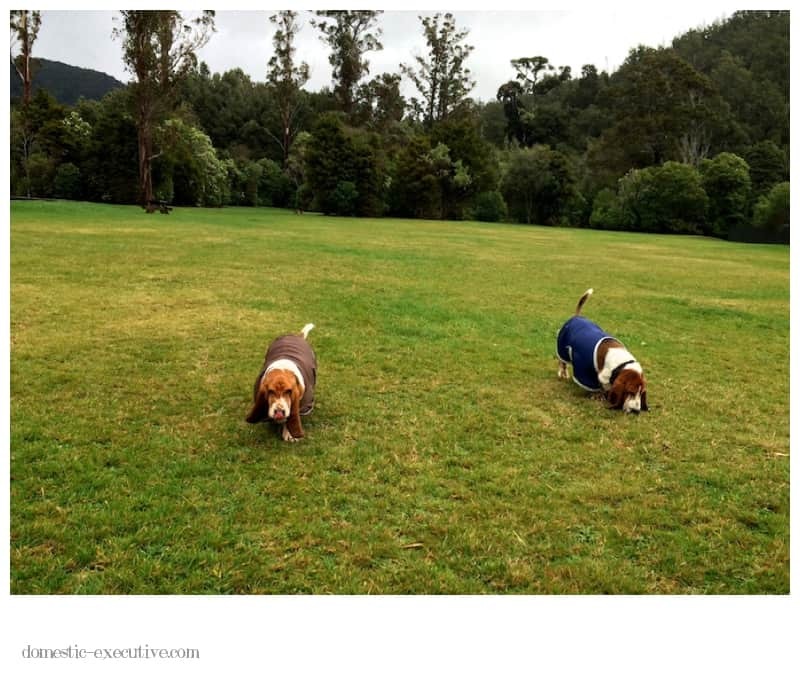 Fortnum’s greatest indignity is to be busy sniffing and suddenly a gust of wind will blow up his coat exposing his nether region to the elements. The hounds year seven in September and officially reach middle age although we’re hoping that all the special measures will keep them healthy and mobile for many more years to come.